Shakespeare's Thematic Puzzles! 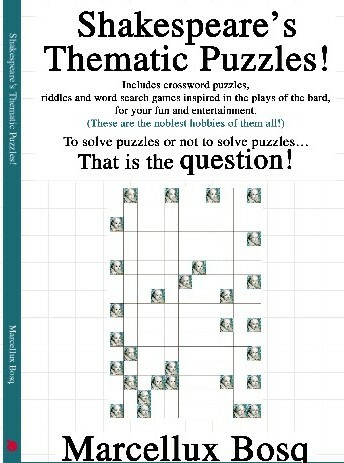 Includes crossword puzzles, riddles and word search games inspired in the plays of the bard, for your fun and entertainment. These are the noblest hobbies of them all! This work is focused in the works of William Shakespeare. However, it is not a history book. It is a book of games inspired in his figure. "Othello used to live in the city of..."
Do you remember where he lived? If you are a fan of Shakespeare, or you want to know a bit more about his work (in a funny way), or you just love word games, this book was made for you. There are different levels for the puzzles. To solve most of them you just need the knowledge that an average educated person has. I must confess that the idea of writing this serial of books belongs to my friends. I have written it just to say "Thank you" to all of them.